composite material. The wash chamber is free of internal pipes and sharp corners. which need to wash tall glasses. Standard equipment includes the peristaltic rinse aid dispenser, which can be adjusted from the control panel. Glasswasher with 39×39 cm rack with electromechanical user interface, constructed with partial double-skin side panels with deep-drawn rounded rack guides and full double-skin door. and sharp corners. 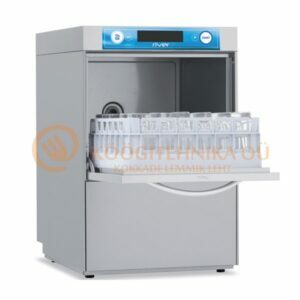 Thanks to the wide door opening and the dual-fl ow wash pump, this machine is also able to wash plates up to 30 cm in diameter. 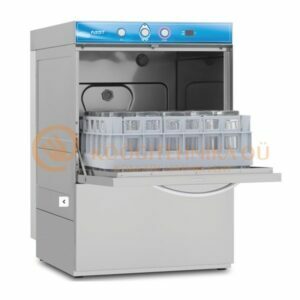 With the use of the optional grille, it also possible to wash a rack of demi-tasse cups and a rack of saucers simultaneously. Standard equipment includes the peristaltic rinse aid dispenser, which can be adjusted from the control panel.